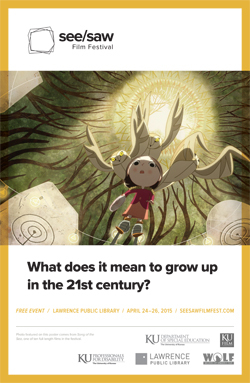 LAWRENCE — The University of Kansas will present the See/Saw Film Festival later this month, featuring works exhibiting, disrupting and renegotiating constructions of children and young people from historically underserved and marginalized backgrounds. The film festival will take place April 24-26 at Lawrence Public Library. One of the opening night features, “Rich Hill,” will be screened at 7 p.m. April 24 at Woodruff Auditorium in the Kansas Union and include a panel discussion with film director Tracy Droz Tragos and author Laura Moriarty. Professor Elizabeth Kozleski, chair of the Department of Special Education, suggested graduate students Maggie Beneke and Sorcha Hyland curate the film festival with the graduate organization KU Professionals for Disabilities. They sought films that take a unique perspective on the expression and representation of children and youths. They found local, national and international stories that heighten the visibility of childhood and adolescent experiences that are normally underconsidered. The festival challenges the status quo in how people imagine and perceive childhood and adolescence with an array of award-winning features, documentaries and shorts, including one 2015 Oscar-nominated children’s animation film, “Song of the Sea,” and a selection of locally produced short films created by Van Go Mobile Arts youths with WOLF (Women of Lawrence Film). The full program, with links to trailers, is available online. KU and community partners include the Department of Special Education, the Department of Film & Media Studies, the Office of First-Year Experience, the KU Common Book, KU Cultural Psychology, Jewish Studies, the Center for Global and International Studies, the Hall Center for the Humanities, Douglas County CASA, The Shelter Inc., NAACP, Van Go Mobile Arts, Women of Lawrence Film, Bert Nash, AWAVA and Heartland Healthcare. For further information or to schedule an interview - please contact Sorcha Hyland and Maggie Beneke at sorchahyland@ku.edu or on 785-864-0544 or 785-330-5137.